In the world of Internet Video Compression on the Mac, Discreet Cleaner has been as comfortable as an old pair of shoes. But those shoes are showing their age. This past summer they were upstaged by the new shoes on the block, Sorenson Squeeze 4 Compression Suite. But the one thing that the new upstart couldn't do was Windows Media, and Cleaner could, albeit with the older codec, WM7. If Discreet was hanging their hopes on Cleaner being the only Mac software that could encode Windows Media, then the fall of 2004 may also represent the fall of Cleaner. Two new applications have been released that allow you to encode Windows Media 9 on your Apple computer. 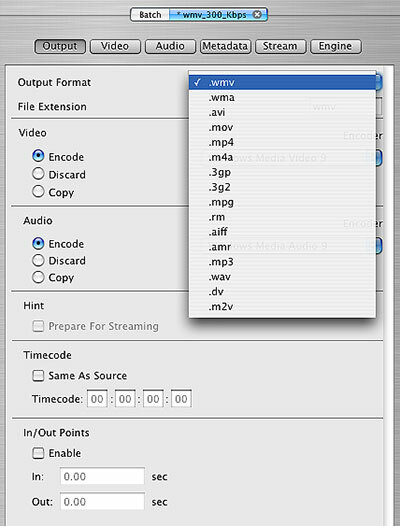 One is Telestream's Flip4Mac, a Quicktime export component used within Quicktime Pro (and eventually within other Quicktime based applications like Cleaner and Squeeze). 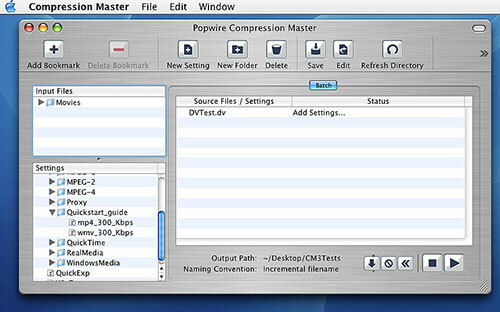 The other is the focus of this review, Popwire's Compression Master 3. Popwire, a Swedish company, first introduced Compression Master here in the States last winter with Compression Master 2. 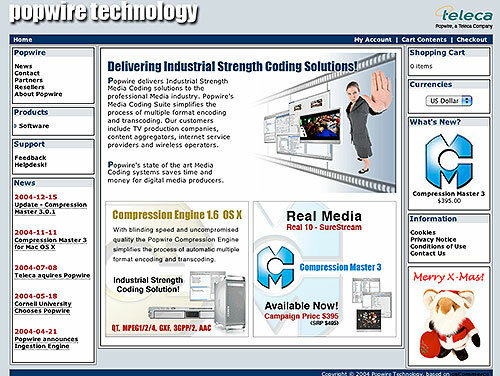 The original Compression Master was developed as a means of creating settings for Popwire's Compression Engine, an application designed to do very large batch encoding. The engineers realized that "the Master" could also be used as a stand alone application, so after a few modifications they offered it for sale. The original version had some issues with the Graphical User Interface (GUI), which had been designed by engineers for engineers. I was hired by Popwire last March to write a Quick Start User's Guide and to create a few presets for Compression Master 2.3. Compression Master 3 has a much improved GUI and I had no input into any aspect of this release. Double clicking on any of the presets in the Settings window will open that setting in the batch window, as shown below. 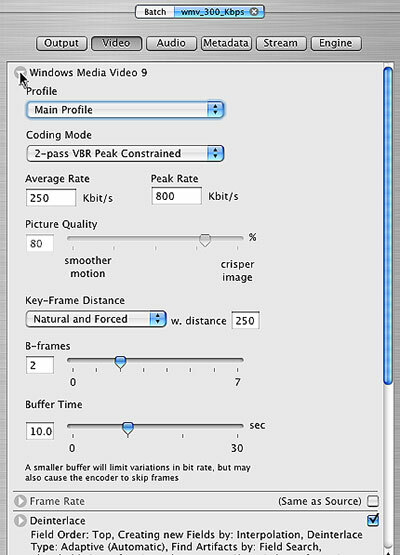 As you can see from this image, Compression Master can output a long list of video formats, from Quicktime to Windows Media to Real to 3gp(used with cell phones and PDA's) and Mpeg. It can also output audio in MP3, AIFF, WAV, WMA, and ACC. For anyone who does high quality video compression for the internet, having a fully adjustable encoder is very important. No two source clips are the same, and to create the best looking and sounding output means being able to tweak all aspects of the encoding process. You would be hard pressed to find a more adjustable video compression application than Compression Master 3. Take a look at the parameters that you can adjust when you click on the Video tab of a setting. And to further explore, let's click on the triangle to the left of the Windows Media Video 9 heading. As shown below, this opens up all the individual settings you can tweak and adjust within each parameter. By clicking on the small box to the far right of each parameter title, you activate it. By clicking on the arrow to the left of each parameter title, as we did below, you can go in and make adjustments to it. The Audio tab opens up a similar window for adjusting all the audio parameters, as seen below. You can also add Metadata to your encoded clip, prepare it for Streaming, and the Engine tab is a carry over from Compression Master's origins and can be used to place the settings you have selected into the Compression Engine application. After you have adjusted a setting, you click it and drag it from the Settings window to the Batch window and drop it onto your source file. Then click the play button in the lower right hand corner of the GUI, and Compression Master does its magic. And how does that magic compare to the competition? If we focus on Windows Media, Quicktime, and Real, it is easy to compare the output of Compression Master 3 with Flip4Mac, Cleaner 6, and Squeeze 4. Let's take a look at Windows Media first. 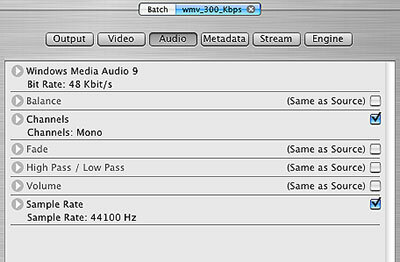 Compression Master 3($395), encodes Windows Media in single and two pass CBR(constant bit rate) and VBR(variable bit rate). To get the same options with Flip4Mac, you need the Pro/HD version($179). I encoded a source clip with a preset that Popwire provided after I made a few minor tweaks (hey I'm a compressionist, I'm always tweaking something). I then took the same source clip and opened it in Quicktime Pro and selected the Windows Media (Flip4Mac) export option and went in and adjusted Flip4Mac as close as possible to the parameters in Compression Master. I then encoded both clips. Compression Master encoded the clip in less than half the time that it took Flip4Mac. The results looked fairly similar with the CM3 clip having a higher Playing bitrate but a smaller file size than the F4M clip. The advantage of Compression Master is that for a compressionist, the above scenario is just the starting point. I will now go in and tweak some more, sharpening here, smoothing there, etc. until I arrive at the best looking and best sounding clip possible. With Flip4Mac, I am done, there are really no more adjustments I can make. When we move on to Quicktime, Compression Master does very high quality Mpeg-4, H263, MJPEG, DV and a few other codecs for Quicktime Movies. Unfortunately, at this time it does not do Sorenson Video. Popwire is currently in negotiations with Sorenson. While Compression Master can hold its own in Mpeg-4 Quicktime Movies it cannot compete with a codec that it does not have. Cleaner 6($549), with the addition of the Sorenson Video 3 Pro codec($299), can create very high quality Quicktime Movies that will play in Quicktime 5 or Quicktime 6. 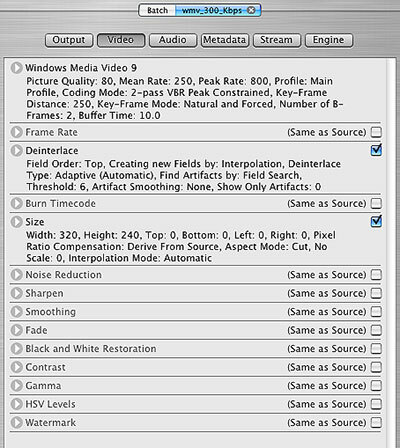 Squeeze 4 Compression Suite($399), and its included Sorenson Video 3 Pro codec can also create the same Quicktime Movies. Compression Master can create Mpeg-4 Quicktime Movies that look as good as those created by Cleaner or Squeeze, but they will not play in Quicktime 5. If we look at Real Media, both Compression Master and Squeeze 4 can create high quality Real 10 video and audio with 2-pass VBR. Cleaner 6 only comes with the ability to encode Real 8 video and audio, but you can add a separate Real Media 10 export component, which gives Cleaner the ability to export Real 10, but only in single pass CBR. Comparing the results from compressing the same source clip, Cleaner compressed the clip in the least amount of time, but with the lowest quality, which is to be expected with single pass CBR. Using two pass VBR, Compression Master encoded the clip in half the time it took Squeeze 4, and the final clip from both compressors was of the same high quality. And even though Squeeze 4 is quite adjustable, it is not as adjustable as Compression Master 3. There would come a point where I could continue tweaking and improving the final output with Compression Master, after I had run out of options with Squeeze 4. At this time, Compression Master does not export Flash Movies (.swf) or Flash Video (.flv). Squeeze 4 is the only major compression application for the Mac that can compress both of these formats. So is Compression Master 3 the right choice for you? That depends. If you want to create high quality Windows Media and Real Media files on your Mac, I would say a definite yes. If you are concentrating on Quicktime Movie files and want to use Sorenson Video, I would say wait a while. I'd like to close on one note about the adjustability of Compression Master 3. For someone who is new to video compression, all that adjustability could seem pretty intimidating. Rest assured that Compression Master 3 comes with a large supply of presets developed by the engineers at Popwire. There are presets for progressive download and streaming video in multiple sizes for every codec that Compression Master can output. These presets will deliver the same quality as you would get from the presets that come with Cleaner or Squeeze. So you can still produce very high quality compressed movies without having to go in and tweak any of the parameters. But it's nice to know that you can, if the mood strikes you. This article first appeared on 2-POP and is reprinted here with permission.